(HARDWICK, VT and WATERVLIET, NY)- Professional floor contractors can now restore or enhance the color of prefinished and previously coated flooring without sanding! Norton|Saint-Gobain Abrasives and Vermont Natural Coatings team up this April to debut EasyWhey™ at the National Hardwood Flooring Association (NWFA) Expo in Phoenix, Arizona. EasyWhey is the newest addition to the Norton Abrasives | Vermont Natural Coatings PolyWhey® Professional Wood Floor Finish line. EasyWhey is easy to apply and dries quickly, so multiple coats can be applied to build color without streaking or masking the grain of the wood. It bonds to the existing floor surface, including prefinished flooring, allowing it to be top-coated with all Norton|Vermont Natural Coatings Professional Wood Floor Finishes. 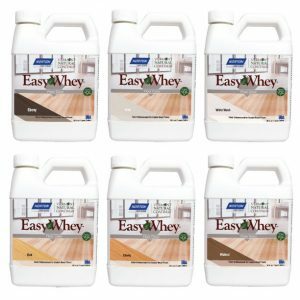 “You could use this product on any prefinished floor in a commercial space,” said Frank Coppolino after experiencing the ease of use and effectiveness of EasyWhey. EasyWhey has been used by contractors without staining or sanding to add color to the basketball courts, fix worn prefinished floors, and make board replacements appear seamless. In some cases, it has saved contractor thousands of dollars in labor. The complete line of Norton | Vermont Natural Coatings Professional Flooring Finishes is distributed throughout the United States and Canada. The family includes PolyWhey 3500 for all commercial and residential wood floors, PolyWhey 2500 for residential and light commercial floors, PolyWhey 3000 sealer, PolyWhey MVP Sport Floor Finish and PolyWhey MVP Sport Floor Sealer. PolyWhey Amber Sealer is a direct-on-wood approach to achieving an amber tone, and our Professional Wood Floor Cleaner is available in ready-to-use and deep cleaning formulations for light daily cleaning to intensive scrubbing. Visit the demo theater at 1:00pm as our technical education experts demonstrate EasyWhey or visit Norton|Saint-Gobain Abrasives and Vermont Natural Coatings in Booth #701 at the NWFA Expo at the Phoenix Convention Center from April 10-12, 2017 to learn more. Want more information? Contact us at info@vermontnaturalcoatings.com or 802-472-8700!